At the highest point of sculptural relief, the thorns of His crown sharply accent this beautiful ornament which artfully juxtaposes Bethlehem's Star, Easter's Cross, a Daisy Flower, and His Crown of Thorns in one presentation expressing "Brightly Shining". Our hope as we began this design was to create an ornament that in one glance would clearly celebrate the Birth of Christ in a way that put His life in perspective. We wanted to celebrate Christmas in Bethlehem while being reminded of the purpose of his birth. We wanted to be reminded of His atoning sacrificial death on the cross bearing the sins of the world in mockery and shame. And then we wanted to celebrate His resurrection on the 3rd Day so that in New Life, as a Fresh Flower, when we are promoted some day to Heaven we will see Him "Brightly Shining". And what a day of rejoicing that will be! This design tells the story of Jesus in one integrated presentation using these four elements: Bethlehem's Star, Crown of Thorns, Daisy Flower of the Field, and Jerusalem's Cross. We hope you're able to share Jesus with those you love, perhaps using this ornament as an 'object lesson'. In summary, the Star of Bethlehem reflects the hope of the Messiah's birth as a backdrop to the promise of our eternal future obtained at the cross with a crown of thorns. Our "Brightly Shining" ornament has been given design code S4B and is approximately 4" by 3". We anticipate this design would be used to commemorate and celebrate Christmas, Easter, Confirmation, Baptism, and Dedication. Posted on March 2, 2015 by Jay Callaway. Hymns like "Amazing Grace" are treasures of our Christian heritage preserved in voice, anthem, and hymnal pages around the world. Whether wandering or steadfast in your faith, whether now lost or now found, at one point we Christians came to this moment of surrender where we were willingly wrapped in the crucified arms of Jesus in eternal embrace. This design reflects the first verse of that most famous hymn, Amazing Grace, interpreted into a porcelain figurine. We believe this Cross and Figurine design would be used in expressions of Baptism, Confirmation, Re-Dedication, Bereavement, and Easter. It measures 6.5" tall by 3.75" wide and includes an acrylic display stand. The scripture reference Luke 15:24 is found on the side of the package. We've assigned it our design number "CAG1". You may find more images of this design on our store's pages at this link for "Found". As we move week-by-week closer to Easter we invite you to spend a few moments on our designs which we've created in celebration of our Risen Savior; starting with this one! Posted on February 23, 2015 by Jay Callaway. An Easter Cross Ornament - or 6 of them! Jesus on the cross. Jesus in the grave. Jesus resurrected on the 3rd day. Jesus alive. Jesus ascended. Jesus our returning King. This year, we want to count down to Easter amplifying some of our other designs which also celebrate Jesus in creative ways. So starting on February 22nd, we will feature one of our designs each week until Easter, as we count down again this year in celebration of our Savior. Posted on February 16, 2015 by Jay Callaway. 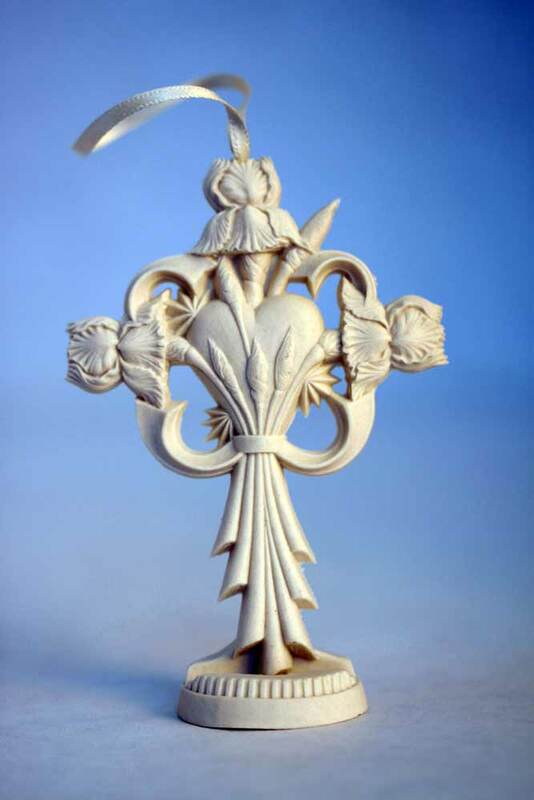 As we designed this porcelain cross ornament we imagined a Mother’s love as a garden gate. Somehow, we wanted to portray the strength and beauty of Mother in one elegant design to commemorate and celebrate Mother's Day, or perhaps Mother's Birthday. So this garden gate started to take shape with our pencil, then our sculpting, and then our clay. Strength and beauty. A gate where Mother stands to nurture, watch, and protect her precious children who play inside the safety of the fenced garden. A beautiful garden full of joy and flowers and laughter and changing seasons; all surrounded by a picket fence, or perhaps a decorative iron fence with fleur-de-lis adorning each fence post. The garden gate’s iron fence posts with its fleur-de-lis tips guard access to the garden, as a mother guards the hearts and minds of her children. This cross design's purpose is to show appreciation to Mom or Grandmother on her birthday, on Mother’s Day, as an encouragement to Mom after a difficult day, to say I’m sorry, and as Congratulations to expectant Mothers-to-be. It is a design of strength and beauty! Every Mother claims this Scripture: "I have no greater joy than to hear that my children walk in truth." – III John 1:4 The Bible verse reference is back stamped on each design and it is printed on the package's side panel. 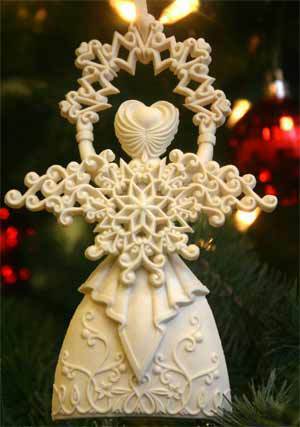 We've assigned this 4.25" porcelain cross ornament the item number of C4EL. An additional design element that we enjoy creating in our artwork is Poetry which is printed on the back panel of the package. May God bless you today as you plan for Mother's Day and remember her Strength and Beauty and how she surrounded you with an Embracing Love! We invite you to review our shop for this and other of our Cross designs, or Heart designs, or Angel designs, or Snowflake designs. Posted on April 28, 2014 by Jay Callaway. As we entered Holy Week and considered Jesus' journey of the cross, in this design we sought to capture and juxtapose the raw wood grains and splinters of the crucifix against his garment wrapped in a bow and draped down the front. This distinct imagery expresses the essence of His atoning sacrifice - a free gift. Not a cheap gift, rather but a free gift. This design's striking imagery expresses God’s free gift of salvation to all and thus the title of this design "Your Gift" Cross Ornament. With this 2.75" tall design to which we've assigned item number C3G, we intended to commemorate and celebrate specific points in the journey of faith including Easter, Baptism, Salvation, and a renewed commitment to be a follower of Christ. The package includes this Scripture printed on the reverse side: "The Lord bless you and keep you; The Lord make his face to shine upon you, and be gracious to you; The Lord lift up his countenance upon you, and give you peace. – Number 6:24-26"
May God bless you today as you celebrate Holy Week and consider "Your Gift", and as you look forward to celebrating our Risen Savior! Posted on April 14, 2014 by Jay Callaway. Innumerable as grains of sand upon countless beaches are His thoughts of us, His care for us, the expanse of His love for us. And His gifts to us likewise are without number. The vastness and richness of His blessings began before Creation and continue today. His grace to us expressed in one moment of time on the cross, for all time, and all humanity for those who believe, confess, and accept Him as Savior. This simple geometric porcelain cross ornament with a sea shell halo behind it has grains of sand washing up on it’s four corners and a Starfish embracing and clinging to the center of the cross. The sea shells of the open halo remind us of the blessings that God has bestowed on us through His Son Jesus. The sand washing up on the cross reminds us of the innumerable blessings we receive when we accept Christ’s gift at the cross. We designed this porcelain cross ornament for the purpose of commemorating Faith, celebration of victories in Christ, and as an expression of the great gift we received at Easter. Our inspiration from Scripture for this porcelain cross ornament design is; "Let the heavens rejoice, and let the earth be glad; let the sea roar…." – Psalm 96:11. This Scripture verse is printed on side panel of the package. This porcelain cross ornament is approximately 4.25″ tall and has been assigned item number "C4RJ". May God bless you today as you Rejoice in His great gift and as you look forward to celebrating our Risen Savior! Posted on April 7, 2014 by Jay Callaway. On Jesus' three year journey to the cross he spoke truth and demonstrated love in every step from Galilee to Jerusalem, where the ultimate expression of truth and love were expressed on the cross. To say it simply, God's free gift of eternal life was paid in his Son's atoning blood sacrifice for our souls redeemed in resurrection on Easter morning. This is truth. This is love. This is the story of the Gospels. 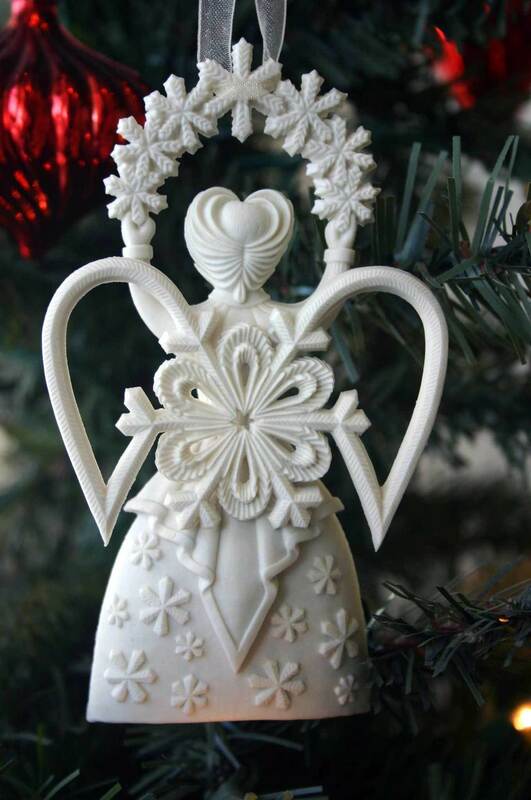 Our handcrafted porcelain cross ornament titled "His Love" interprets this love story told in the Gospels. The design inspiration arose out of an open Maltese cross which is surrounded by a loose flowing but symmetrical halo outline form that frames four large hearts (Matthew, Mark, Luke, John) which taken together express the truth of the cross with the heart of His Love. This porcelain cross ornament design commemorates those moments in life where God demonstrated his love and purpose to you or your loved one; moments of Faith, Encouragement, and Protection. The Scripture reference that we were inspired to share with this 4.25" cross design is one that expresses this truth and love in summary: "Nor height, nor depth, nor any other creature, shall be able to separate us from the love of God, which is in Christ Jesus our Lord". – Romans 8:39. The Scripture reference is back stamped on each design and printed on package side panel as well. We enjoy sharing Poetry as an additional creative element of our designs which is printed on back panel of this design's package. and the heart of His love. May God bless you today as you acknowledge and share the truth of the cross and the heart of His Love in every circumstance! Posted on March 31, 2014 by Jay Callaway. This beautiful and powerful Scripture begins: "He that dwelleth in the secret place of the most High shall abide under the shadow of the Almighty." As we meditated on this passage and considered how to translate it into a porcelain cross ornament, we saw the word "dwell", and in another translation "shelter", and were inspired to implement architectural elements such as columns, roundels, and soaring cathedral-like vaults and flying buttresses into our design. And as the chapter continues in the 4th verse, there is this beautiful imagery of assurance of God's protection and covering, like a fowl with their young nestled against them, under them, beneath them. So in addition to the architectural elements noted above, we wanted to translate this imagery of "beneath His wings". Our design combines these elements with a set of wings centered on a contemporary fluted architectural cross. This cross design expresses the faith and assurance that in all circumstances our hearts and lives are in His hands. We know comfort in drawing close to Him, staying beside Him, nestled against Him beneath His wings. May God bless you today as you find your way Beneath His Wings in every circumstance! Posted on March 24, 2014 by Jay Callaway. Made new. Brand new. Without blemish or spot, wrinkle or blot. Fresh and clean. Perfect white. The title of this Cross Adornment (Ornament) is Renewed. Jesus' perfect and pure heart upon the cross as atonement for our imperfect and impure heart. A renewed life begins at the cross! A heart abloom in the center of an elegant open cross reflects a soul renewed in His perfect love. This hand-crafted bisque porcelain cross design expresses encouragment and celebration of a new day and a new life. There are many reasons to give and receive this cross ornament, but principle among them include celebration and commemoration of Faith, Easter, Salvation, and a Renewal of Commitment to Christ. On the back of the Adornment package, you'll find this Scripture: The Lord bless you and keep you; The Lord make his face to shine upon you, and be gracious to you; The Lord lift up his countenance upon you, and give you peace - Numbers 6:24-26. We've given this 2.75" cross design the item number C3N. May God bless you today as you are Renewed when you meditate on His word. Posted on March 17, 2014 by Jay Callaway and filed under Uncategorized. Restores My Soul Gift Ornament by Pure Grace displayed on optional porcelain stand. This Cross Gift Ornament is our interpretation of Psalm 23:3. The refreshing spring and early summer blooms of the majestic and showy iris, together with the heart at the center of the cross, symbolize restoration of the soul where God’s love was poured out in the life of his Son. His grace restores my soul to it's proper fullness and beauty; to it's original freshness and vibrancy; to it's innocence and promise of eternity in the presence of our loving Father. He restoreth my soul: he leadeth me in the paths of righteousness for his name’s sake. We designed this cross ornament for the purpose of Encouragement and expression of Faith. Every single year in mid-May after the dreary winter rains here in the mid-Willamette Valley, fields of Iris burst in blooms creating bright checkerboards of color. The purple and yellow (our brand colors :-)) petals are so rich and vibrant and fresh! These images inspired this design. We are so prayerfully thankful for that same transformation of our souls, and so in praise and adoration to our Heavenly Father we invite you to join us as he Restores My Soul. The Scripture reference for this design is: "He restoreth my soul: he leadeth me in the paths of righteousness for his name’s sake" – Psalm 23:3. The Scripture reference is back stamped on each design and is also printed on the package side panel. This bisque porcelain cross ornament is approximately 4″ tall and we've assigned it the item code of "C4S". For each of our Gift Ornaments, we've written poetry to further express the design sentiment and complement both the physical sculptural relief expression and the Scriptural truth. The poetry is printed on the back panel of the package. May God bless you today as you meditate on His word and find that He does indeed restore our souls! Posted on March 10, 2014 by Jay Callaway. Beside Still Waters . . .
Beside Still Waters Heart Gift Ornament - Porcelain - Displayed on optional porcelain stand. We designed this very intricate and beautiful heart ornament for the purpose of expressing Comfort and Encouragement to our brothers and sisters in Christ when they are in those moments when words can not seem to adequately say what your heart wishes it could. This gorgeous heart is edged in crochet-like loops and with Lilly pad blooms. Beautifully displayed in the center of the heart is a Lilly pad with blooms peacefully floating on still waters. The Scripture that inspired this design is: "He maketh me to lie down in green pastures; He leadeth me beside the still waters." - Psalm 23:2. The Scripture reference is back stamped in sculptural porcelain detail on each design to be a permanent reminder of the source of this design. The Scripture is also printed on the package side panel. This heart is about 4.25" across its largest dimension. In addition to the Scripture, we enjoy writing Poetry to complement the expression which is printed on the back panel of this package. May God bless you today as you meditate on His word and find that He does indeed lead us, even beside still waters. Posted on March 4, 2014 by Jay Callaway. An open heart, transparent to one another, surrounded by delicate roses and crowned with wedding rings. This heart expresses the promise that a new life together holds with the commitment to one another in a sacred promise to love. We designed this sophisticated heart ornament for the purpose of commemorating and celebrating Weddings, Engagements, Anniversaries, and that sense of renewal when one says they "promise to love". The Scripture reference and foundational design inspiration is from Hebrews 13:4a where it says "Let marriage be held in honor among all". This Scripture reference is back stamped on each design and printed on package side panel. Perhaps this is the right time to re-new, re-commit, re-double, and re-express your Promise to Love? If you'd like to see additional images of this design, be sure to click through this link to the Promise to Love heart on our website. Posted on February 11, 2014 by Jay Callaway. Over the last few years we've enjoyed taking our Snowflake Angels into a new direction with more vibrancy, more expression, and more purpose. These extra dimensions have been brought about by the addition of an attached wing to the body of our Snowflake Angel. The attached wing is an embellished version of our Snowflake for that particular year, and together, they create a Family of a Gift Ornament, Adornment, and a Snowflake Angel centered on a common theme. We hope you enjoy collecting and expressing that indeed our time together sharing warm hearts with loved ones during the Holidays passes as quickly as a snowflake melts in our warm hands! Posted on November 29, 2013 by Jay Callaway. Open revolt in the name of freedom is reverberating throughout the Middle East in these historic days. Two-thousand years ago one act of Supreme sacrifice followed not by insurrection, but rather by Christ's Resurrection, was a call to eternal freedom that continues to reverberate all around the world. Today we are so thankful that we can celebrate our freedom in Christ! Our Pure Grace designs are inspired by Scripture and are hand-crafted in our studio from high-fired bisque porcelain to help express an authentic sentiment in every season and circumstance of life's journey. Posted on February 24, 2011 by Jay Callaway and filed under Cross. As we enter into a season of Thanksgiving and "Gift-giving" it seems an appropriate time to be reminded of the ultimate gift that our Savior freely gives to those who ask. It is called grace. G-R-A-C-E "God's Riches At Christ's Expense" as you may have heard it defined. Each of our Gift Ornaments express this gift as a "surprise" scripture verse, Ephesians 2:8, hidden under the lid and revealed only when the lid is lifted open as the ornament is being removed from its package. It sends a subtle message in a hidden place that is only revealed when the gift is opened. Perhaps in a small way, its a reminder of His gift to us as we experience the unwrapping of His life in ours. He's given us the gift, we only need to begin to open it and receive it as such, to find grace. Posted on November 16, 2010 by Jay Callaway and filed under Uncategorized and tagged Gospel. Our very first design we called "His Love". The architectural background formed by a Maltese cross surrounded by hearts and superimposed with 4 large hearts served to visually express "the truth of the cross and the heart of His Love". Basing the design on historical interpretations, we saw the 4 Gospels (Matthew, Mark, Luke, and John) in the four large hearts and with them, were reminded of Christ's care and concern and love poured out......to them, and to us! The scripture Romans 8:39 inspired the title of this design, stating "Nor height, nor depth, nor any other creature, shall be able to separate us from the love of God, which is in Christ Jesus our Lord." This 2004 design was "transformed" in 2008 to the more "open" scroll work found below, but its message and purpose are unchanged. Sharing God's Love, Celebrating His Blessings! May your life by transformed by His Love! Posted on September 29, 2010 by Jay Callaway and filed under Cross and tagged Business Purpose Cross Gospel. The blessed, glorious truth of Easter: our Savior lives! On the third day sunrise revealed an empty cross and our risen Savior. This cross reflects the new days sun as it was rising on that glorious day with Christ's crown of thorns and robe draped over itself. Posted on April 4, 2010 by Jay Callaway and filed under Cross. As we continue to celebrate this Easter season, we pray that His Peace would be come Yours. Posted on March 6, 2010 by Jay Callaway and filed under Cross and tagged Cross. in God's gift of eternal life. Posted on February 20, 2010 by Jay Callaway and filed under Cross and tagged Cross Gospel.